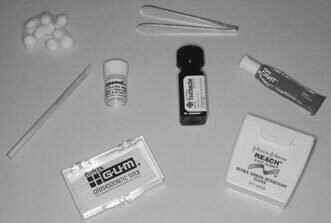 Recent trends on the internet survival and preparedness groups today seem to center upon natural disaster preparedness packages or pandemic emergency supply kits, however one hears very little concerning emergency dental supply kits. This kit will help you to deal with a toothache, loss of a filling, cap or crown, tooth fracture, and gum irritation. This kit is for emergencies only. It is not intended to replace regular professional dental care. I bought a dental extraction kit a couple of years ago, also have one of those kits that you make temporary fillings with. Also have a few books my dentist gave me from when he was in dental school. Also have a lot of whiskey to kill the pain before I pull the tooth that people trust me to pull. When working in the mouth, remember to always wear protective gloves from your first aid kit to prevent the spread of infectious diseases. I hate going to the dentist, just hate it. I can remember the dentist, while I was in the Corps saying that the mouth causes more illnesses then anything else. He said if you keep your mouth and teeth in good shape, you'll always be healthy. My grandma used to say, "be true to your teeth or they'll be false to you". Re hating the dentist. Me too. Bad experience in childhood still gives me flashbacks. It's usually takes two Valium just to walk into his office!